Hello, it is Cook the Book Fridays! What does this mean? It means that I get to show you some process photos for a recipe from Dorie Greenspan's Everyday Dorie. 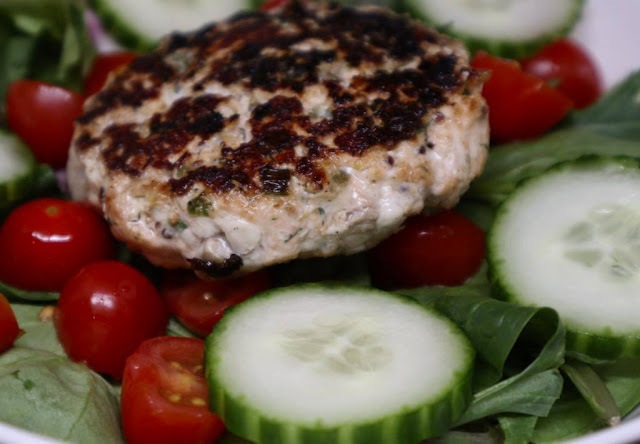 This month brings us to page 174 from the cookbook - Salmon Burgers. Last week, after my clay class I was walking around an area in Ottawa that was, of course, new to me called Wellington. I was actually looking for a place to eat lunch. At one point I looked up (it was a super windy day) and saw that I was in front of a store called Sas Love's Meat Market. After looking around, I realized that they not only sold meat products but salmon as well. I purchased about half the amount of salmon that the recipe calls; which ended up making 4 sizeable salmon burgers. I am so happy that I chanced upon a local produce shop. Sourcing good quality salmon seemed to help the flavour profile of the salmon burgers. I found that even without a binding agent the salmon patty held together quite well for ours. 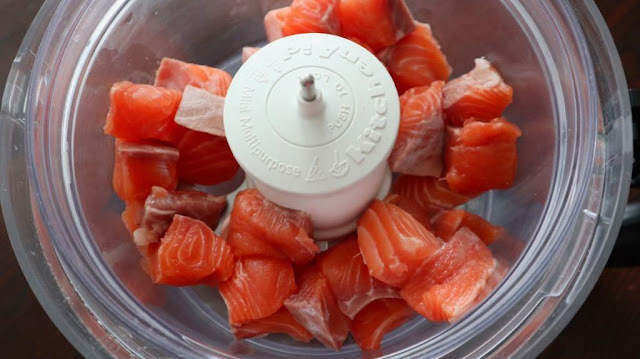 After drying the salmon fillets, Dorie says to pulse them just a few times in a food processor. We cut ours into equal smaller chunks and then only pulsed the salmon 4 times for fear of over pulsing! 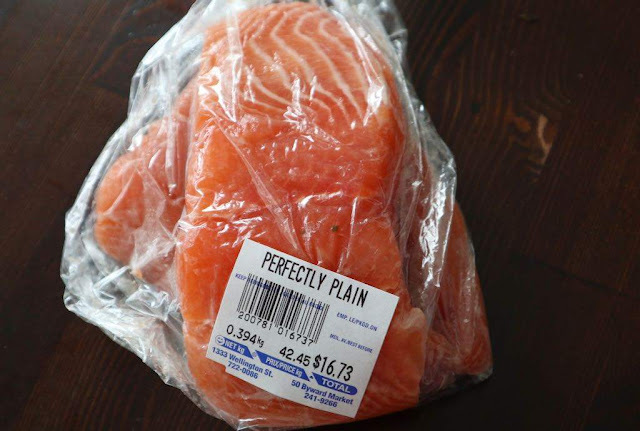 This seemed to ensure that the salmon meat was a good consistency. As we only had balkan style yogurt in the fridge, I used that in putting together the salmon burgers. 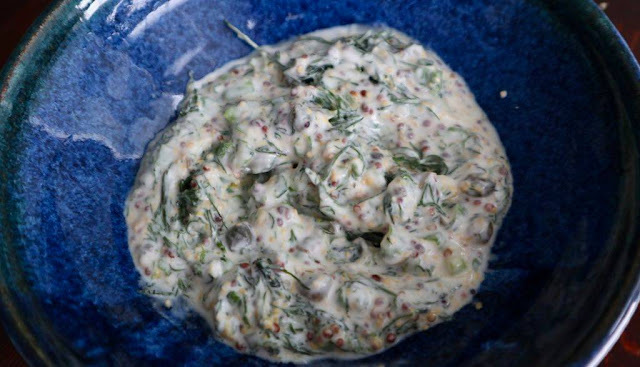 The rest of the ingredients were about 2 stalks of roughly chopped dill, 1/4 cup balkan yogurt, zest from half a lemon, 2 tablespoons of cut capers, handful of cut scallions, and 2 tablespoons of grainy mustard. Next, we gently mixed the sauce into the processed salmon, but didn't over do this part. We then chilled our mixture in the fridge for 2 hours while we went to work out. Since I had cut the down the recipe by half, we ended up making 4 reasonably sized salmon burgers. Using gloves seemed to help in shaping the burgers so that the salmon pieces didn't stick to our hands. To cook, we turned the heat for the cast-iron pan to medium-high. Then once the pan was hot, we turned the heat down to medium and cooked the burgers for 3 minutes each side. This seemed to be just the right amount of time and heat needed to cook the burgers through but still leaving the inside moist. 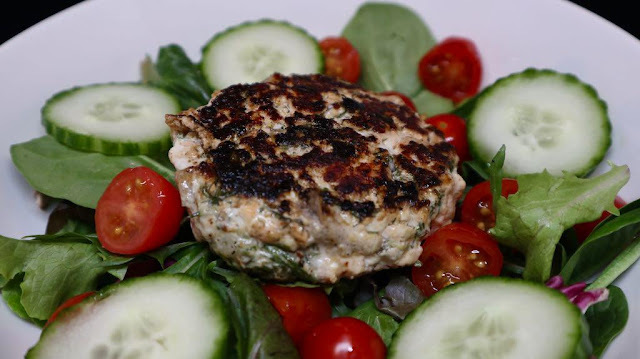 We had our salmon burgers on top of salad! Though, Dan also added soba noodles to his for more sustenance. We found that this salmon burger recipe was super easy to put together once you had all the ingredients. 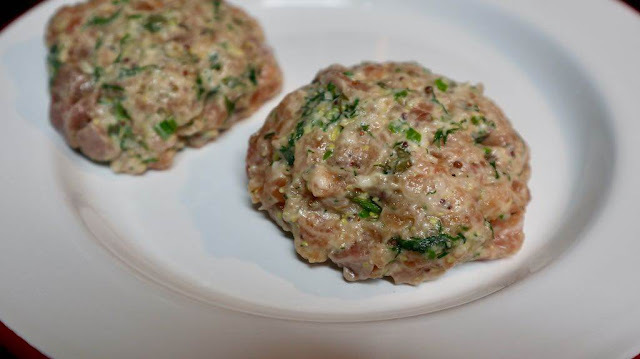 Dan loved the salmon burgers and thinks that we should add them to our food rotation in order to have more fish in our meals. I am also wondering if the sauce would do well just layered on top of the salmon fillets and then baked for an even easier dinner prep and meal! 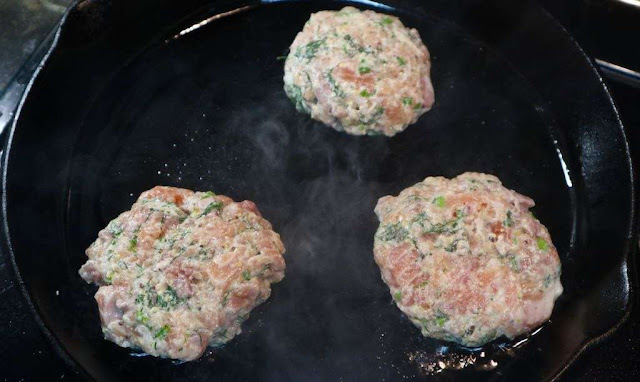 Oh and after quick search, I found the recipe for these salmon burgers here. Also check out the Cook the Book Fridays page to see how everyone else did with this recipe! I will say 'Aye' to your idea of topping salmon with the sauce and bake! And dinner will be on time. But your patties look great though. That is EXACTLY how I made/ cooked the patties that fell apart! So curious. Yours look great! I love all kinds of seafood. So finding another recipe for salmon works for me. Sourcing fresh salmon is always a challenge. You got some really nice ones. I used Balkan-style yogurt, too. I wonder if that made a difference in how well it held together, because I had no issues with the patties. I loved the flavours in this one. Your burger looks great! Glad that you did not have the issue of them falling apart! Your burgers look really wonderful and that's great that you didn't have any issues with binding! I wonder if the Balkan-style yogurt helps make a difference? Nice job. I cooked my salmon burger 3 minutes also and was very gentle when I slid it out of the pan. It was perfect. I usually cook burgers, etc in my cast iron pan but chose not to this time. 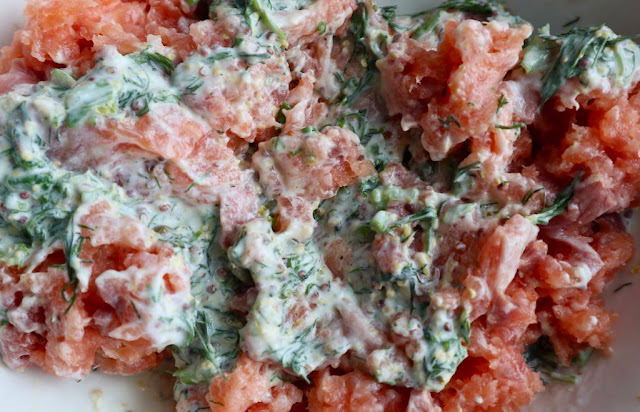 Did your salmon burger stick at all or did you oil or spray it? I love soba noodles with anything so this is a good idea. Wow you got a gorgeous sear - yum ! My guys would like this to be added to rotation as well, no better review than that lol :) I actually just took a big scoop of the mix and added it to my sprayed fry pan, then pressed down with the spatula to form a burger. Lucked out with no issues of falling apart this time. The only thing I had in common was that I dried the salmon well, wonder if that played a part. Great job !